Dry skin, difficulty walking or unusual behavior could be anything from mites to Wobbly Hedgehog Syndrome, and it’s your job as a responsible hedgehog owner to spot the symptoms that could indicate your prickly pal is feeling unwell. 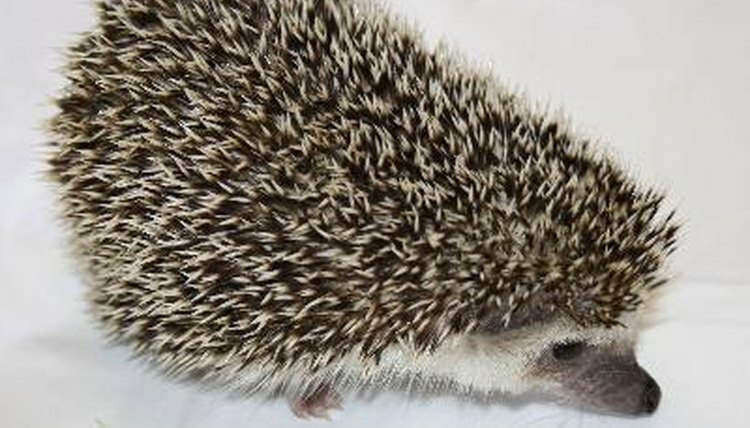 African pygmy hedgehogs are exotic pets, so if you’re at all unsure about whether your hog is sick or just a little grumpy, seek advice from a vet who specializes in exotic species. A happy, healthy hedgehog is inquisitive and interested in her surroundings. Sniffing and licking are her way of checking out everything, so if she suddenly seems lethargic, overly sleepy or cold, she could be trying to go into hibernation. Unlike wild hedgehogs, hibernating kills African pygmy hedgehogs, so it is incredibly important to keep your pet’s living quarters at roughly 70 to 75 degrees Fahrenheit, which is the typical temperature of a centrally heated house. Bright eyes and a clean nose are signs your hedgehog is in good shape. Oral and nasal discharges are often symptoms of respiratory disease caused by a bacterial infection. Dry and dusty bedding can also irritate your hedgehog’s lungs and cause breathing difficulties. Take your hedgehog to a vet at the first sign of respiratory problems because bacterial lung infections can prove fatal. A well-socialized hedgehog is friendly and welcomes interaction from her owner. If your happy-go-lucky pet turns into a growling bundle of huffiness overnight and refuses to uncurl, something may be wrong. Constant hissing or grumbling are also signs she could be in pain or distressed. Hedgehogs are prone to cancer, so if you find any lumps, bumps or growths on her skin, have them checked out straight away. Baby hedgehogs scratch and shed their spines between 8 and 12 weeks of age, and although it’s uncomfortable for your pet, there’s no need to worry. This natural process is called quilling, and as the new spines grow they irritate your hoglet’s skin making it dry or scaly. If your hedgehog scratches all the time or loses enough quills to expose patches of skin, it may be a symptom of mites, fleas or a fungal infection and you should seek a professional course of treatment. Wobbly Hedgehog Syndrome, also known as WHS, is a fatal neurological disease resulting in muscle atrophy through damage to the brain and spinal cord. Early symptoms include shaky legs or frequent falling to one side when attempting to walk. If your pet hedgehog is unsteady on her feet, see a vet immediately. Loss of appetite for more than a couple of days might be a sign of digestive problems, particularly if it is accompanied by diarrhea. Mouth infections, tooth issues and gum disease may also make her lose interest in her food. Hedgehogs eat and poop daily; constipation could mean she has eaten something indigestible that is causing a blockage so have her checked out immediately.